Jiang Chen (River City) is located southeast of Simao, bordering Laos and Vietnam. Due to its lower elevation, warm and humid climate, the tea from this area is typically silky and sweet, but mild. The characteristics of the tea from this area are very similar to Yiwu teas. Accordingly, teas from this area are often used to blend with Yiwu teas. This tea brick, sold exclusively in the U.S. by Bana Tea Company, has been traditionally stored in Hong Kong for over thirty years before it was purchased and stored in Yunnan. The tea has no paper wrapping and came in packs of four. After decades of aging, this tea has become very round, silky and smooth. It possesses a rose powder scent with a hint of ginseng notes. The pronounced sweetness of this tea is unique among other aged Pu-erh of its class. It is a tea to be savored on special occasions. 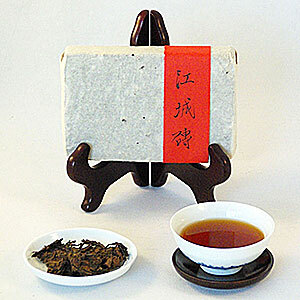 Use 3 grams of leaves for a medium-sized (about 4oz / 120cc) gaiwan or teapot. Follow the suggested steeping times below. Wow, the 70's sheng you sent me was truly amazing. I shared it at a tea session with another local Pu-erh aficionado. We all knew instantly that this was a special occasion to savor. Such a deep earthy sweetness to it, much more so than any other of the few Pu-erhs I've had now from the 60's and 70's. Thank you so much for letting me experience that one. Thank you so much Linda, the 70s Jiang Chen is filled with beauty and the chi is deep, penetrating and has a sweetness to it, what a find, and the aroma is really exquisite. It is rare to find authentic 70s tea at this point. Good job.